So just like you, I saw a number of roasted cauliflower recipes all over social media. In my quest to add more veggies into my diet, those recipes that look interesting/yummy and include veggies I can tolerate are definitely worth a try. I have to tell you, I thoroughly enjoyed roasted cauliflower! Now, based upon reviews that I read, I chose to try the recipe that used cauliflower pieces versus the whole head. Reviews for recipes which roasted the entire head whole, indicated it didn't cook evenly so some of the cauliflower was soft and other parts were hard. I apologize for the small portion, I had to snag this picture before it was all gone!! I made an entire head and this single serving was all that was left. That should give you a good indication as to how tasty this dish is....and it's really easy! Preheat oven to 450 degrees. Rinse and cut up the cauliflower; place in an 11x7 inch baking dish. In a small bowl, mix the oil, 3 Tbsp, of the mustard, and salt and pepper to your liking. Brush this mixture over the cauliflower and placed in a large baking dish. Bake at 450 for 20-30 minutes until soft. 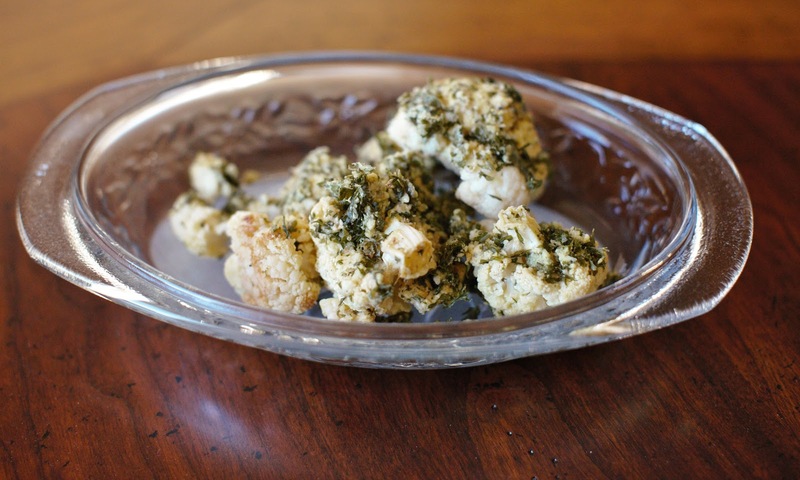 While the cauliflower is baking, mix together the parsley, parmesan and the remaining mustard. Sprinkle this mixture over the cauliflower and serve. 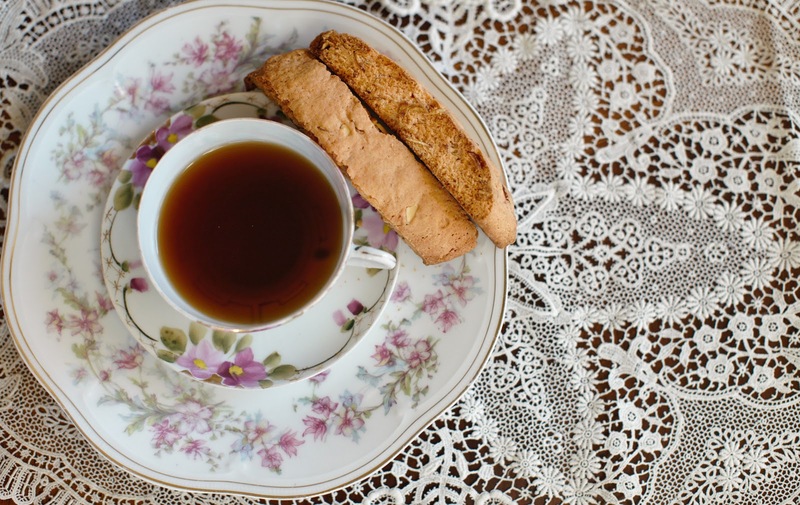 I enjoy a good biscotti now and again, especially with a hot cup of tea or coffee for dunking! This recipe had a wonderful almond flavor which was exactly what I was looking for. Even better I already had all the ingredients in the pantry, except for one so I made a substitution that I'll share with you. Stir together sugar, butter, *brandy, and extracts in a large bowl, then stir in almonds and eggs. Add flour, baking powder, and salt until combined. Pre-heat oven to 350 degrees with the rack positioned in the middle. Using moistened hands, halve dough and form 2 (14x3 inch) loaves. Place on a cookie sheet lined with parchment paper. Bake until pale golden, about 30 minutes. Carefully transfer loaves to a rack and cool 15 minutes. Using a serrated knife, slice into 3/4 inches slices, on the diagonal. 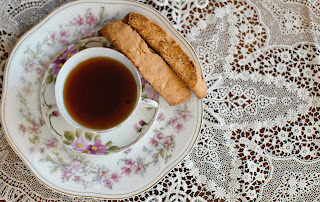 Arrange biscotti with one cut side down, on a clean baking sheet (again, I lined mine with parchment) and bake until golden, 20-25 minutes. Transfer to rack to cool completely. *since I didn't have any brandy in the house, I substituted creme de' almond liquer that I had. 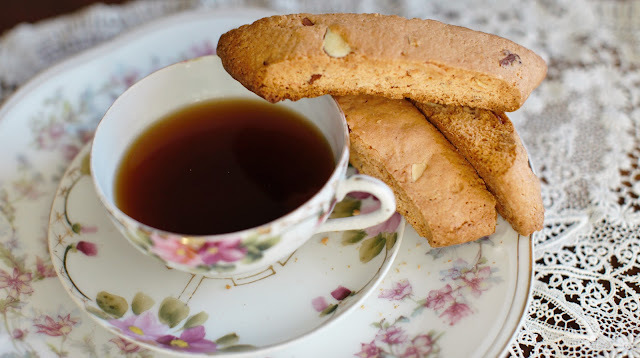 It gave the biscotti an even bolder almond flavor and slight pink color! To me, there's nothing better than a bowl of soup in the winter months...whether it be lunch or dinner. I'm totally satified with a hearty soup for a meal. A month or so ago, I tried a tomato bisque that was absolutely delicious! With that success, I thought I'd try a split pea soup. 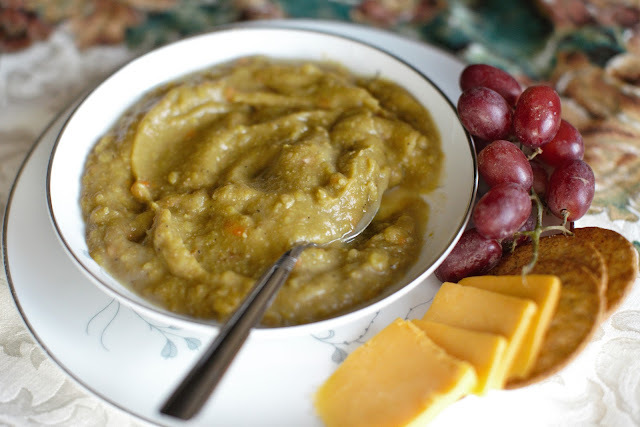 I've always enjoyed split pea and was dreaming of a creamy pea soup with chunks of ham. This recipe definitely delivered.....and the best thing is, you can throw all the ingredients in the crockpot and let it simmer all day long. **I soaked the peas in 2 quarts of water overnight. There are mixed reviews as to whether you need to do this especially when you're cooking the soup in the crockpot, so you decide. Remove peas from the water and add them and the rest of the ingredients to a crockpot. Cover and cook 7-8 hours on low, or 4-5 hours on high. Remove bay leaves before serving. I like my soups a bit creamier, so I chose to thicken mine up before serving. To do that, I removed approximately 3 cups of the soup and placed it in a blender, I also added ¼ cup of instant mashed potato flakes (it was a great thickener...I love google!) to the soup. Puree for approximately 30-45 seconds and then added that mixture back into the crockpot. For me, it was the perfect consistency! Now today, after chilling in the fridge all night long, I found the soup needed to be thinned a bit, so I just added a bit of milk. So good!!! I'm always up for trying new healthy breakfast recipes. If they include eggs, I'm definitely interested since I'v found that eggs for breakfast can really keep me satisfied for a long time. This particular recipe included sweet potatoes, which I found really intriguing so I gave it a whirl. I would give it a "good" versus "great".....but you may think differently. It really wasn't too tough to put together and it serves up nicely. Preheat the oven to 375 degrees. Grease a *9x9 baking dish with coconut oil or cooking spray. Also add 1 Tbsp. coconut oil to a skillet set to medim-high heat. Brown the breakfast sausage. While the sausage is browning, peel and slice your sweet potato thin to ensure they come out tender. Line the baking dish with the potatoes. In a medium bowl beat the eggs with a whisk and season with salt and pepper. Top the potatoes with the sausage, then pour the eggs over the top. Layer the spinach on top, as well as any other ingredients you may like. (ideas: tomatoes, onions, asparagus, cheese) I added about ¼ cup of shredded mozarella. *as you can see from the picture, I used a cake tin since I don't have a 9x9 dish.